Following the path of many tourists to Norway, we found ourselves in the Sognfjord area, and stayed overnight a couple nights in Balestrand (aka Balholm). Also in the wake of tourists, we tried our hotel’s koldtbord (smorgasbord) the first night — I ate at least ten types of seafood. The next night we yearned for something a little more down to earth. A street map indicated a place called “Ciderhuset”, or Cider House, about 1.5 miles away from the town’s port, and we made our way there the second night. Good thing we did — it was closing for the year the very next day! Ciderhuset features food and drink made with apples, plums and other fruits from their orchards. The owners of Ciderhuset — family run — were our wait staff, and they overwhelmed us with their friendliness. The next day even, when we were at the port picking up our rental bikes, they saw us and said hello! The first card, at the top, I am sending them as a thank you. 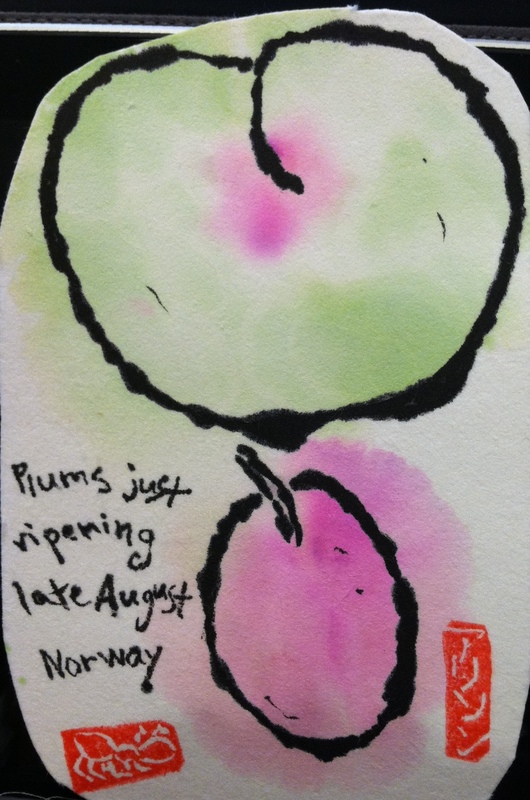 It’s inspired by a photo of a plum tree from their orchard — even so late in August, the plums weren’t ripe yet! Below are a few more attempts at capturing Ciderhuset’s plums. All the painting of plums got me wanting my favorite fruit dessert — upside-down plum cake. I’ve used a couple of recipes, one from Real Simple here, and another from Epicurious here. I rather like the Real Simple on — I swap out the sour cream and use low fat Greek yogurt instead.